Why pay additional hosting fees for a mobile site that in most cases you can't update! Mobile Connect Puts All Your Business's Contacts & Directions One Touch Away With Any Smart Phone! 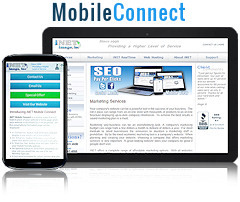 The iNET Mobile Direct page displays only when accessed by a smart phone. If accessed by a tablet your full website will display. The iNET Mobile Direct page displays only when accessed by a smart phone. If accessed by a tablet or computer your full website will display. As part of the iNET RealTime system there are no additional hosting fees with our Value Hosting account..